Walking onto the football field that night, we had done all that we could to prepare. The rumors that the opposing team was undefeated, loud, huge in size and even larger on talent reached us – and it shook us. But our coach had prepared us well. He broke it down in our mind. We each knew our assignments and if we carried out those assignments flawlessly, we would win this game. Throughout the week, we drilled through the fundamentals. We ran each play to perfection; trying to find ways to improve what to do; how to handle their strengths and our weaknesses. Coach drilled into us that not one of us could let up or we would let everyone down. He asked for a committment – that each of us would commit to doing our very best and leave it all on the field that night. That way, whatever the scoreboard said, we could walk away knowing we did our very best. That night, I learned a lot about digging deep; about working as a team, and what a bunch of underdogs can do when they believe they can take down a Goliath. He did not ask for his problems to be made small. He did not ask to be removed from having to face the problem. He did not ask for a way around – he realized that God had given him something to make it through the darkness, the valley; the battle that he was facing. Often, we are stymied by what we are facing. Our first look is often with eyes that see the problem through the ability of our flesh. We try to think our way through. We try to battle our way out… But when our mental capacity fails and our physical strength limits us – then what? Our problem becomes that ‘giant’ we cannot conquer. However we perceive our enemy or the problem we face is often calculated by what we know of ourselves. When we stop there, the giant seems to grow. 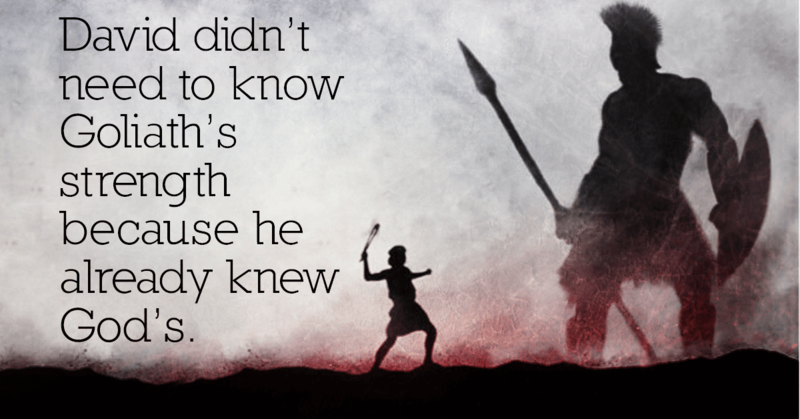 When David faced Goliath, he stood with something that the king of Israel, nor the leaders, nor all the armies could comprehend – David knew his God was bigger than this puny little man who cursed God and defied His army. David stood knowing God had his back. We often fail to see just who we are in Christ. Knowing who I am in Christ; what His promises are for me and being able to see the situation through God’s eyes, gives me a view that makes me feel bigger than I really am… I am ‘enlarged’ as David said. We left the football field that day knowing we had done our best. The scoreboard reflected the tally of points in our favor, but we had won something far more significant – the knowledge that giants can and will fall. I have seen the giants of addiction, giants of depression, giants of abuse all fall to the One who is more powerful than them all. But none of them were totally conquered without God. Go to that Rock that is higher than any of us and see with eyes of faith that you can and will succeed. My grandmother was only 4′ but a prayer warrior!